Specifically, the Hay Manger from Super Pet. We've had one of these types of holders, usually to keep leafy veggies off of the cage floor as we just put hay in loose, since we first got Tweak. Today, we came home from work around 5pm to find she'd managed to get it down off of the cage wall and get WEDGED into it. Her head, neck and one front leg were caught in the hinge area. I have no idea how she managed to get herself wedged like that, but there's no way a safe cage accessory should even allow for the possibility. We thought she was dead when we found her, as she was cool and limp, but as soon as I moved the entire thing, she perked up and tried to pull herself out again. We ended up having to use a wire cutter to get her out of it, and while she's alive, the vet isn't sure if it'll be for long mostly due to the fact that she's close to 8 now and that sort of stress on any pig, let alone a fairly old lady, is pretty bad. Our exotics vet, thankfully, is open until 7pm every night, so once we got her out of the holder she got an immediate visit. She's very, very stressed and has a hard time moving her back end (though she sure could squirm when I washed it off). She did, however, start wheeking at me when I had her wrapped up in the towel after the vet cleaned her up (the my husband was home around 2 and she was fine, so we figure she was stuck for around 3 hours! ), and she did want to eat and drink so I'm taking that as a good sign. 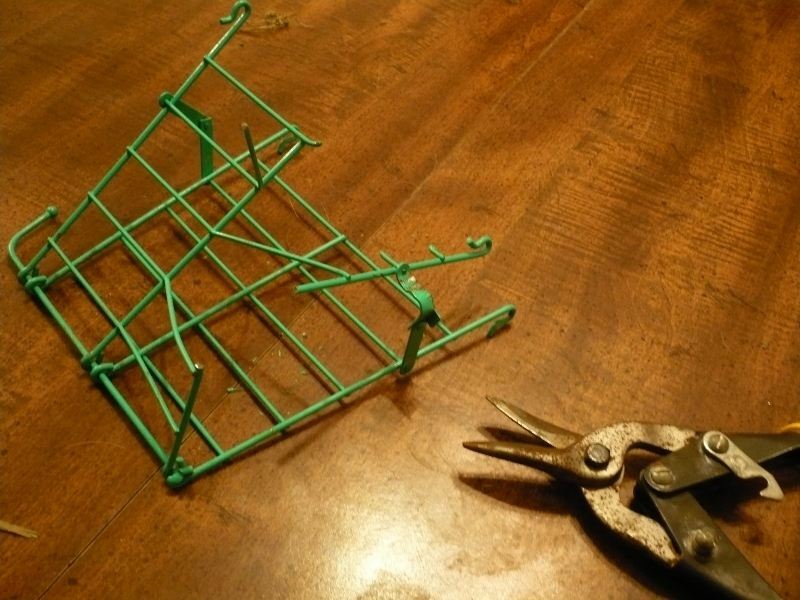 Just a caution for those of you that might use this style of hay/veggie holder. We'll never buy anything similar to that design again; even if it was weird, rare instance, it's not worth risking it happening a second time. How scary! Sending good thoughts for your piggy. Thank God you found her when you did! What a close call you had. Good thing you came home when you did. I am so sorry for the scare. I hope she recovers. Thanks for letting us know about this. Would you like me to permanently add your photo to the forum? Oh my goodness! I hope she'll be okay. Ohhh I have that hay holder in that same color!!! Good to know. Hope Tweak recovers soon. I'd hate for anyone else to have to come home to find their poor little pig stuck like that. Oh no. Glad she is okay. I didn't like those holders but for a different reason. Poor Tweak; she must have been so scared. I hope she feels better soon. Poor Tweak. I'm glad she's okay. Someone on one of the other threads mentioned using paper lunch bags for hay holders. I've been trying those lately for the smaller piggies in our rescue and they seem to love it. The paper bags seem pretty low risk. Yes, it is so much safer when you can eat your way out of the bag if you go in head first and don't want to turn around or back out. Bugz loves doing that and with the hay burrowers and pouncers around here I am afraid to use hay racks for most of them. How scary! We had a hay rack like that. I chucked it a year ago. I sure hope Tweak makes a full recovery. Poor girl. Awww poor Tweak! That had to be so scary for her! Thank you for the warning about that hay rack! I'm glad Tweak is ok. Scary to find them stuck. I do know that one of the brands of hay has those holders in their bags as a 'free' holder. I seen it in a Target store, think the brand was Kaytee but can't remember for sure if that was the brand or not. I do know it said Animal Planet on them and that's what made me look at the bags. Oh how scary! Poor Tweak! I'm so glad you fonud her. How scary! Hope she's on the mend and glad you found her when you did. Poor piggy. I have one of those hay mangers, but haven't been using it. Will be throwing it away now. And will also be calling my aunt, as she's currently using the same hay rack for her new piggy. Think I'll also be keeping a pair of wire cutters on hand next to the pig cage from now on. Thanks, Snidget, I added it. Oh geez, that's the hay rack I use. I'm so glad you were able to react quickly and get Tweak out! How about sending the company an email of what you wrote here. I doubt they'll do much about it but maybe they'll improve the design in the future?